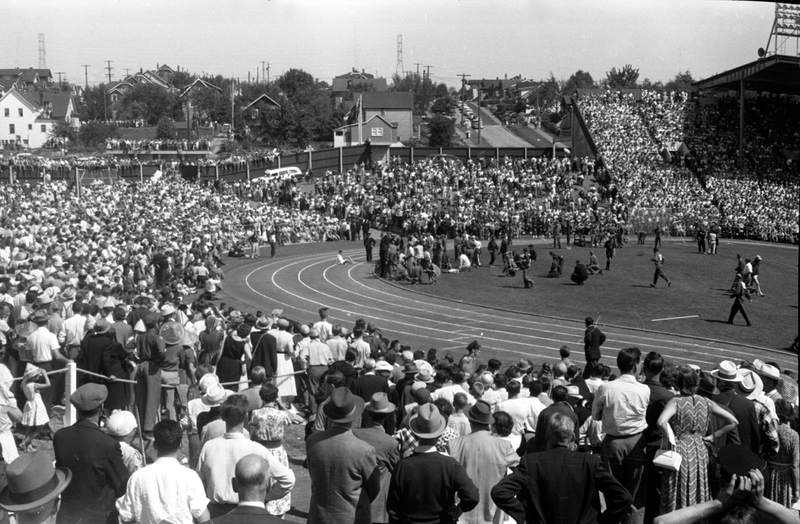 The 1954 BE&C Games marked the first time Eastern and Western Canada were linked for a simultaneous live telecast. This unique feat was made possible by a circuitous route totaling some 2,750 miles (4,425 km) across the United States from Seattle to Buffalo (via Portland, Sacramento, Salt Lake City, Denver, Omaha, Des Moines, and Chicago), thus linking CBUT, Vancouver, with CBLT, Toronto, and the microwave-connected television stations of Eastern Canada. In connecting the Vancouver production centre with the eastern network stations, CBC television coverage of the Games was made available to Canadians the same day. Rear Screen slide of CBUT graphic created for the television broadcast of the 1954 BE&C Games. Television coverage was provided to those stations not connected by microwave facilities through the use of kinescope recordings that were made available from Toronto the following day. In addition, in the event of possible technical failure during closed-circut telecasts, arrangements were made to fly television recordings from Vancouver to Toronto for processing, printing and distribution. CBUT’s first official “live” mobile telecast was on Air Force Day, June 12th, 1954. A mere 6 weeks later, CBUT put its new mobile unit to the test for the broadcast of the 5th BE&C Games. 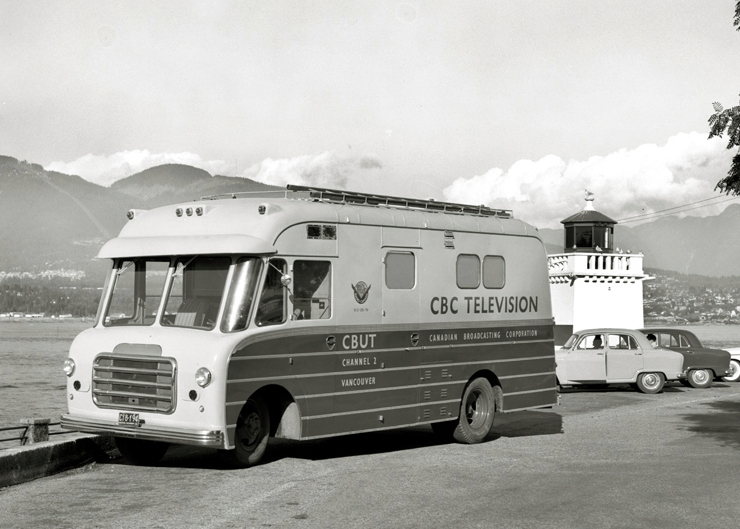 Equipped with 3 portable electronic TV cameras and a crew of 10, the Vancouver mobile unit, along with one on loan from another CBC centre, traveled around the various BE&CG venues making it possible for the TV viewer at home to see many BE&CG events broadcast live. CBUT (Channel 2) Mobile Unit. Photo: Alvin Armstrong, CBC Vancouver Still Photo Collection. One mobile unit was stationed close by the broadcasting centre at Empire Stadium to cover the track and field events with three “electronic” TV cameras. One camera was located at the finish line, the second was for interviews with the athletes as they made their way back to the dressing rooms, and a third was mounted on a jeep – providing full general coverage of track and field events and infield activities. 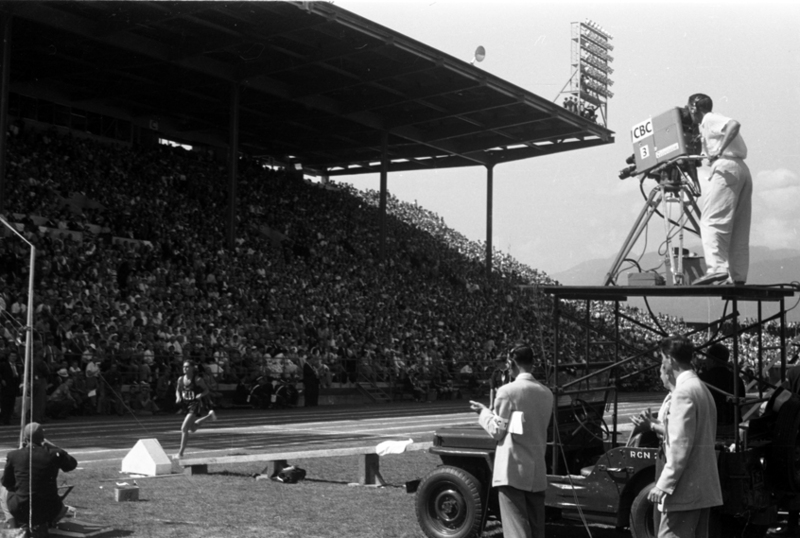 CBC “electronic” television camera mounted atop a jeep at Empire Stadium covers the Track and Field action, August 7th 1954. Photo: Alvin Armstrong, CBC Vancouver Still Photo Collection. The 2nd mobile truck unit, on location at Empire Pool at the University of British Columbia, concentrated on the swimming and diving events. CBC film cameramen covered the other sporting events at the seven different locales (the mobile unit provided coverage for the cycling and boxing finals). 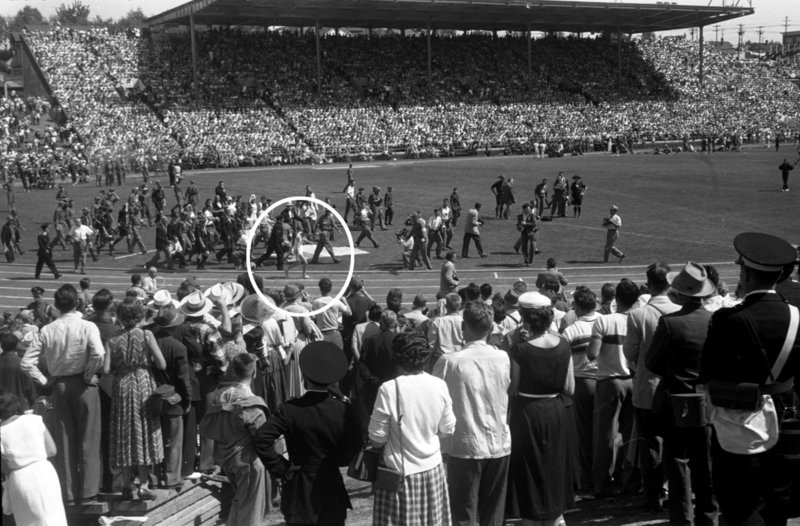 Film footage of events, such as rowing at the Vedder Canal venue, was edited in Vancouver and integrated into the daily cross-country “live” telecasts. According to a 1954 edition of the CBC Times, more than 700 miles (1,126 km) of lines were used for the CBC’s radio and television coverage at the nine BE&CG venues. The farthest away was the Vedder Canal at 45 miles (72 km) and the nearest one was Empire Stadium right next to the CBC broadcasting centre at the Exhibition Grounds – master control for the CBC’s entire operations. Lines from all the venues terminated at the broadcasting centre, making possible inter-communication at any time during the Games. 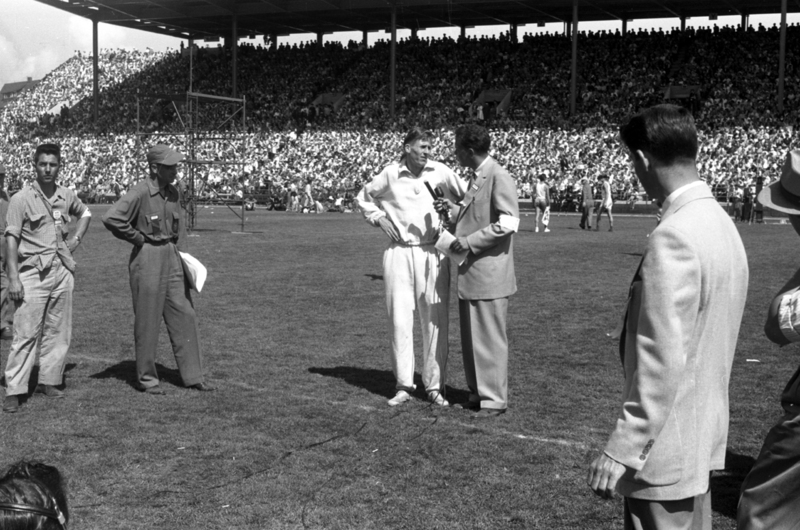 Roger Bannister being interviewed by a CBC reporter after the “Miracle Mile”, August 7th 1954. Photo: Alvin Armstrong, CBC Vancouver Still Photo Collection. Not only was equipment brought to Vancouver for the Games, but also much of the broadcasting staff. 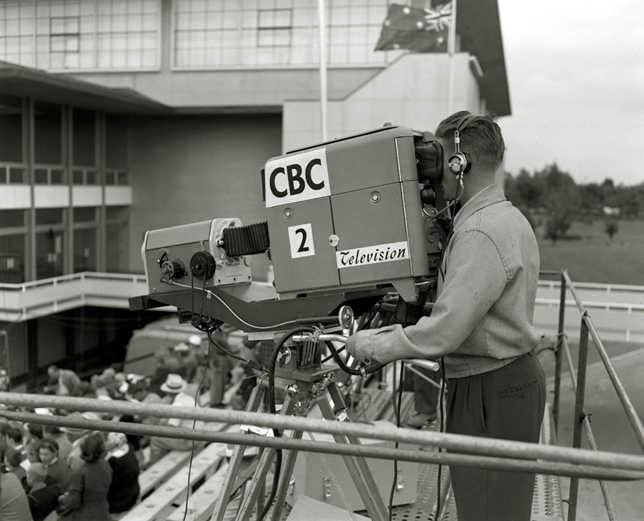 Since CBUT was only 7 months old, the majority of the CBC staff and technical crew that worked to broadcast the Games came from Toronto and other regions in Canada. The greater part of the CBC BE&CG crew. Includes inserts of the local CBUT executives involved. 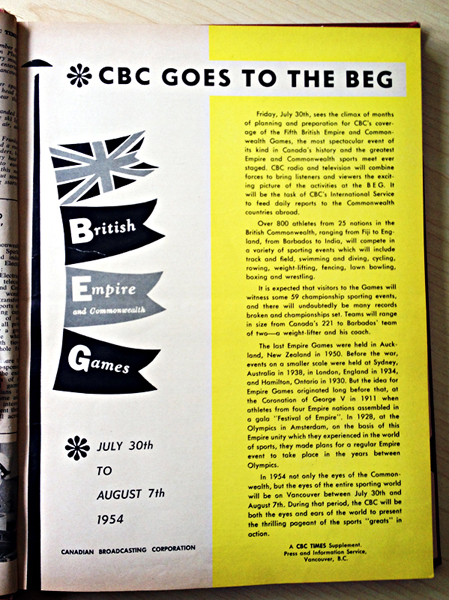 Photo from the “CBC Times” special supplement for teh 1954 Games. John W. Hughes, on loan to the CBC from the National Film Board in Ottawa, served as liaison officer between the public relations committee of the BE&CG and CBC television cameramen. His task was to see that the film reel, still photographers and TV cameramen were free of obstructions in order to provide viewers the best pictures possible. Four sports commentators covered the Games for CBC television, working under the direction of George Retzlaff. Producers for the television broadcasts were Peter Elkington from Vancouver; Jack Lingman and Wilf Fielding from Toronto; and Gerard Renaud from Montreal. 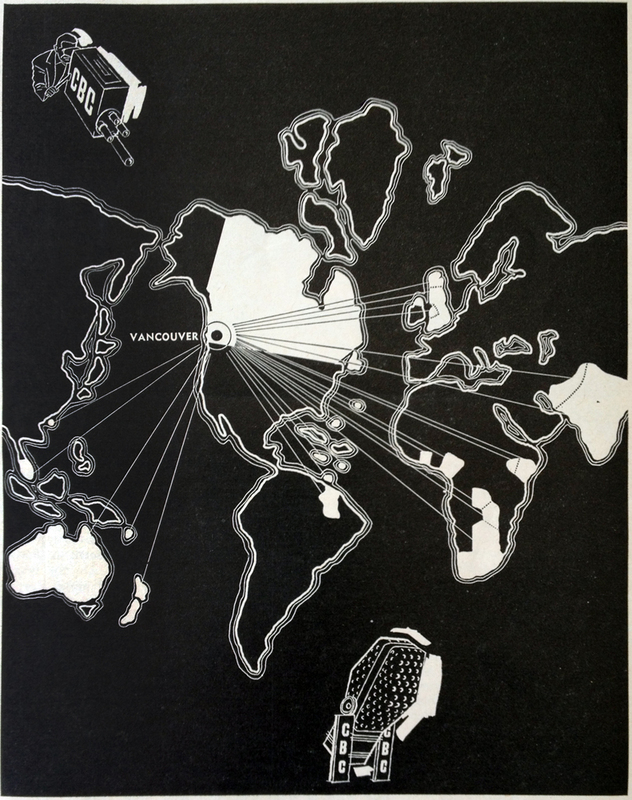 “CBC Times” Special Supplement for the 1954 BE&C Games in Vancouver. 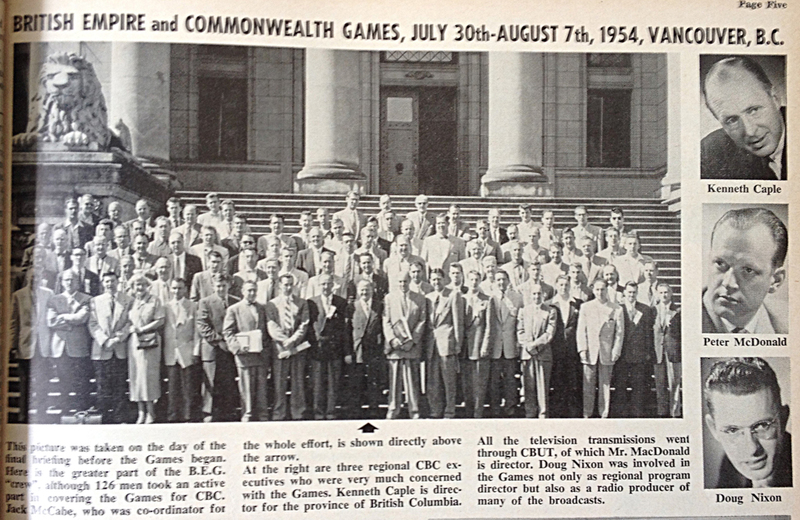 As the host broadcaster for the Games, the CBC provided individual coverage for all parts of the Commonwealth save for the the U.K. and New Zealand who had their own representatives in Vancouver. The setting up of Canada’s first direct East-West TV link was made in co-operation with the four American TV networks. Negotiations began in January 1954 and were carried out with the assistance of the National Broadcasting Company [NBC], whose officers took a personal interest in the CBC project, applying on behalf of the CBC for the necessary allotments of time on the network. On August 7th 1954, the final day of the British Empire Games, NBC carried the CBC’s “live” telecast of the arrival of H.R.H. 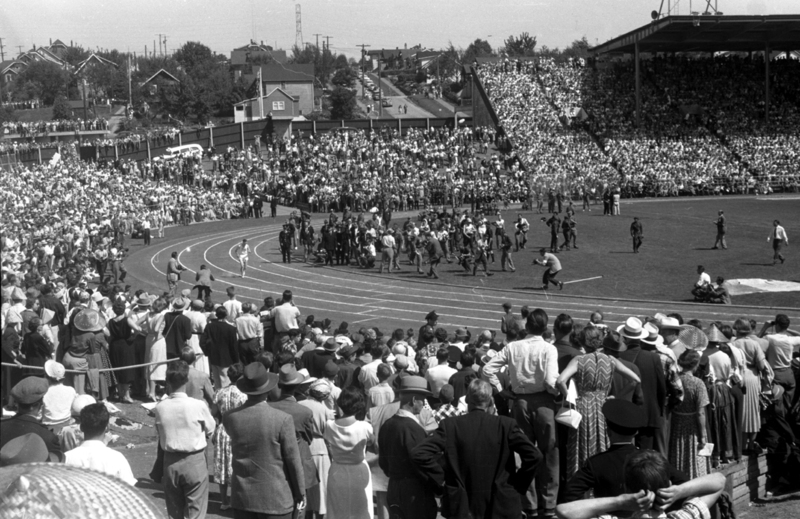 the Duke of Edinburgh at Empire Stadium (for the closing ceremonies), as well as the “miracle mile” race. These events were seen by NBC viewers throughout the United States. In Canada, TV coverage of the Games was sponsored by the Northern Electric Company. The “CBC Times” local Vancouver television schedule for the Games. The final day of events of the Games, August 7th, provided stadium spectators and television viewers (to quote the intro for ABC’s Wide World of Sports) “the thrill of victory and the agony of defeat”. First, the “agony of defeat”. English marathon runner (and world record holder), Jim Peters collapsed repeatedly during the final 385 metres of the BE&C Games marathon. He entered Empire Stadium 17 minutes ahead of the field, however the effects of severe dehydration and heat-stroke took over and he never completed the race. CBUT staff photographer, Alvin Armstrong, captured the following photos with his Leica camera. CBC TV cameras also captured Peters’ heartbreaking marathon finish. BE&CG – Vancouver, Jim Peters, August 7th 1954 – excerpts – YouTube. The “thrill of victory” is best exemplified by the Men’s 1-Mile Final, which saw the only two sub-4 minute mile runners (Roger Bannister and John Landy) compete against each other. 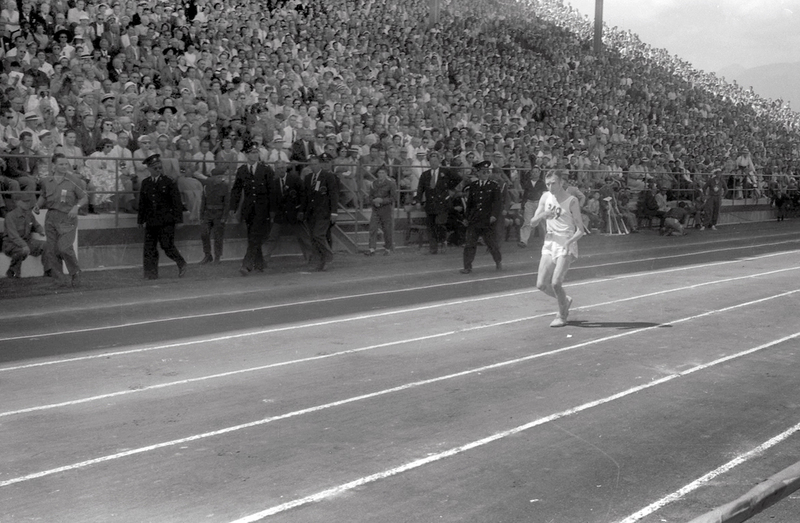 Dubbed the “Miracle Mile” this race is still considered one of the most exciting moments in sports history. CBC television cameras captured the entire event live. ▶ “Miracle Mile” August 7th, Vancouver – Live television footage – YouTube. For more information about the 1954 British Empire and Commonwealth Games I suggest you check out the new exhibit at the BC Sports Hall of Fame and Museum called “A Week You’ll Remember a Lifetime”, it opens July 30th. The Vancouver Sun is also marking the 60th anniversary of the Games with some interesting features. Fun fact: At the time, the 35,000 seat Empire Stadium was the largest stadium in Canada. The cure for writer’s block: molded gelatin salad! You can read about the gold medal rowers in Jason Beck’s (curator at the BC Sports Hall of Fame and Museum) article in the spring 2014 issue of British Columbia History, http://bchistory.ca/publications/journal/index.html – some back issues still available.